I recently went to Prague with my boyfriend for a couple of days. None of us had been there before but both our families had so we knew it could be nice short getaway for us. This was our first proper holiday together, so of course we wanted it to be special. Needless to say we didn’t regret our choice! I was lucky to find a convenient holiday package with British Airways — I’d never thought to book through them but do check out their offers — which included the flight and a 4-night stay. Our hotel was amazing and we highly recommend it if it fits your budget (see here). We had a huge breakfast everyday, ample fuel for long walks around the city. I had read a travel guide prior to leaving so I had a good idea of what would be worth visiting. But as always, it’s good just to walk around and discover new things by yourself. Prague is relatively small so it’s easy to get to most places on foot. Their public transport is also pretty cheap when compared to most European cities. Here are some pictures I took and the 4 things I loved the most about the Czech capital. Just a little disclosure: I don’t have great photography skills, so consider these as standard holiday snaps. I love architecture and I love looking at old and interesting buildings whenever I go. I often just imagine them being my home and think about what my life would like inside. Prague has some amazing and elegant buildings, most of which are located in the old Jewish quarter which went from being a more impoverished part of the city to the richest one after being rebuilt in the late 19th century. There are bits of great architecture all over Prague, of course, you just need to look up while you walk. Here are some examples. Aren’t they pretty? Prague is fairly cheap and it’s perfect for a holiday on a budget. We knew we were going to take advantage of the fact that the beer is very cheap, I’d say it’s easy to find places which sell Pilsner for less than 2 € for 500ml (or a pint for you Brits), which I’d say is a steal. There are countless breweries and Czech pubs where you can try different beers and the famous national ones like Budweiser (not the American one though!) or Pilsner Urquell. I recommend a place called Beer Museum which was fun because you can drink a sample of up to 10 beers from a list of over 30. If you do go to Prague, I’d suggest staying away from the bars in the main squares as they are clearly going to try and rip you off. Prague has such an interesting history, and I imagine a lot of people aren’t familiar with it. We chose to go on a walking tour and learned tons of things we didn’t know before or perhaps had just glossed over in school. There were plenty of opportunities to learn more about the Czech people and about the events that made them who they are today, especially some of the major episodes over the last century. The tales of the Nazi occupation and the Communist era are truly fascinating. 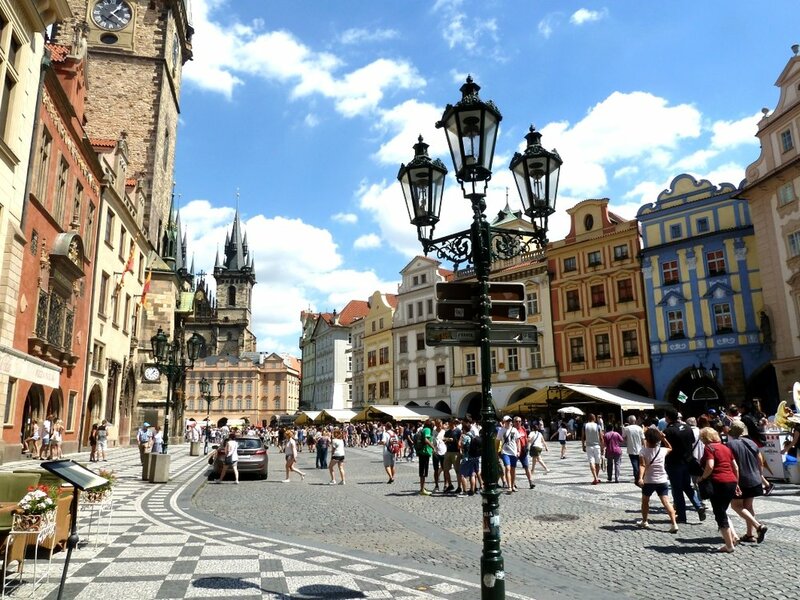 Even though Prague was packed with tourists, and that is one of the downsides, I felt a sense of peace and I found it to be very relaxed and safe. We were never out ridiculously late, it’s not the place to go if you want rip-roaring night life, but what I mean is that there isn’t a huge amount of traffic, you’re surrounded by people, and the atmosphere is relatively calm. I think Prague is a very romantic city and being there with my other half was beyond words. A holiday I’ll never forget. Have you ever been to Prague? Did you like my pictures?